“As part of K Tahta Armenian Community Sunday School’s annual teachers training program and focusing specially towards advancing the school’s ability in teaching Western Armenian classes, this year we invited renowned Western Armenian language specialist, author of several textbooks on methods for teaching Western Armenian to non-Armenian speakers using audio-visual techniques, professor of Sorbonne University of Paris and founder of “Mashtots” Armenian school Dr Hilda Kalfaian – Panossian. 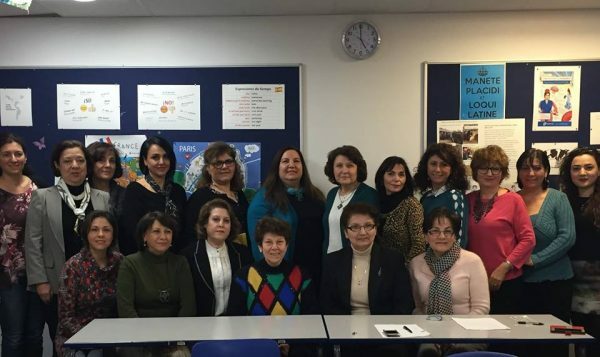 Dr Kalfaian-Panossian presented an excellent lecture and training session to our teachers, implemented open lessons at all three levels, breakthrough, preliminary and intermediate, for the students of all classes. Some parents also were present on those lessons. Teachers as well as students participated in the training and lessons with great interest and enthusiasm. To read the article published by Dr Kalfaian-Panossian, PLEASE CLICK HERE.